The Music Man Project was set up by David Stanley in Southend in 2001 with the express purpose of providing children with learning difficulties or special needs with the equipment and guidance to be able to express and enjoy themselves through the medium of music. Since that first tentative start the Project has evolved into multi-award-winning organisation with branches in many places in Britain, South Africa and with aspirations to expand into India and North America. The Project has staged concerts at Royal College of Music, the London Palladium and will, on 15th April 2019 stage a concert at the Royal Albert Hall. 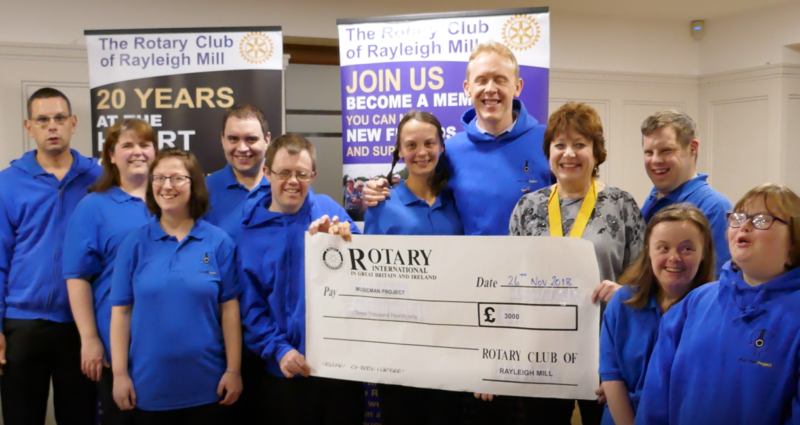 The funds for the Club’s donation were derived from our successful Charity Golf Day in July when the Music Man Project was named as the main beneficiary. For more information on The Music Man Project click here.